Established in 1834 by the deCordova brothers (Joshua and Jacob), the Jamaica Gleaner Newspaper is now the oldest operating newspaper in the Caribbean. It was actually launched on 13 September 1834 as The Gleaner and Weekly Compendium of News. It started at a crucial moment in the island's history; a time when the era of slavery was coming to an end. Interestingly, the paper actually grew from an advertising sheet the deCordova brothers used to publicize goods for sale! It was printed on Saturdays and sold for a subscription of ten shillings per quarter in the city, and thirteen shillings per quarter in rural areas. The first issue included a mission statement of sorts with the editors promising to "please, amuse and to inform while holding domestic life sacred ­ no attacks on private lives would be made." Three months later the paper's name changed to The Gleaner: A Weekly Family Newspaper devoted to Literature, Morality, the Arts and Sciences and Amusements. Two years later the paper expanded to 4 pages and was being published daily except for Sundays. Advertisement sheets were distributed for free and subscribers could get the paper by 6 a.m. Although the paper became a public company in 1897, Michael deCordova served as managing director until 1948. By that time the Daily Gleaner was involved in charitable causes, and in book publishing, having started to print the "Gleaner Geography and History of Jamaica" in the 1920s for use in schools island wide. It also created its own imprint, Pioneer Press, which published books by Claude McKay and Tom Redcam, Jamaica's first Poet Laureate. The Children's Own started publication in 1950 and the Overseas Weekly Gleaner began in 1951 as did The Star. 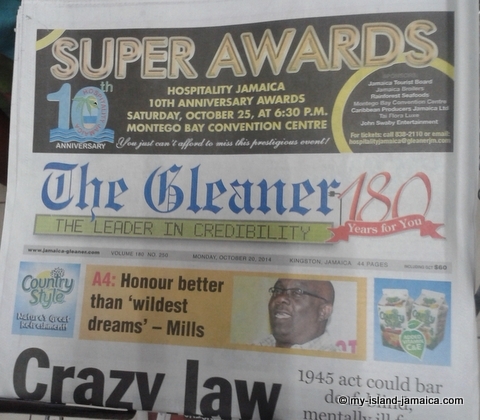 Today, Jamaica boasts multiple newspapers alongside the Gleaner. These include magazines and journals The Star, Observer, and Herald, and various media and publishing houses and imprints, and numerous book and stationery stores. The Gleaner's operations by the way are now fully computerized, and it remains the island's foremost newspaper group, employing close to 500 people in Jamaica, with offices in Kingston, Montego Bay, America, Canada and the United Kingdom. The overseas weekly editions are published in the United States, Canada, and Britain. The Daily Gleaner was mentioned by Dr. No's photographer in the 1962 James Bond film Dr No. Today, The Gleaner Company continues its long tradition of public service, running an annual Newspaper in education programme and CXC Exam Techniques Seminar as well as Spelling Bee and Honours Awards competitions. In addition, the company partners with other media houses to support Crime Stop, the Allman Town Redevelopment, PALS (Peace and Love in Schools), the United Way of Jamaica and the Century Club, UWI. Old (and very old) editions of The Gleaner are made available courtesy ofNewspaperArchive.com and is available at Gleaner Digital Archive. To learn more or get the latest, visit the Jamaica Gleaner's website. See Also: Jamaican Newspapers from Jamaica Gleaner Newspaper.